This shy medium-sized cormorant with blackish plumage nests in small, widely dispersed colonies on steep, inaccessible cliff faces. 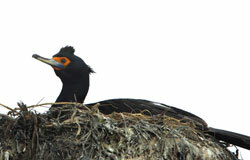 Never venturing far from the sea, the red-faced cormorant (Phalacrocorax urile) comes to land only to breed or roost. Breeding occurs in a narrow band from the Gulf of Alaska to the central and western Aleutian Islands, through the southern Bering Sea to Russia and on to the northern Sea of Japan. In Alaska, there are also nesting sites on the Pribilof Islands and in Norton Sound. The species is not migratory. A few winter observations indicate that adults and immature birds disperse and feed near their breeding areas. Pribilof Islands – St. Paul is the most accessible location in Alaska with a chance of seeing nesting red faced cormorants and the best places are Reef Point, Zapadni Cliffs, and Ridge Wall. Though less accessible, St. George, with its vast cliff faces, attracts the greatest biomass of nesting seabirds. Chiswell Islands, Kenai Fjords – easily found here. Homer Spit – sometimes seen from the Alaska Marine Highway Service ferry terminal. Kachemak Bay – often found nesting on Gull Island. Ferry route from Homer to Kodiak – found all along the route. Kodiak – can be seen from the shore in winter at Fort Abercrombie State Historical Park or on Chiniak Bay at the Buskin River State Recreation Site. They can be seen offshore at Cape Chiniak from spring through fall.